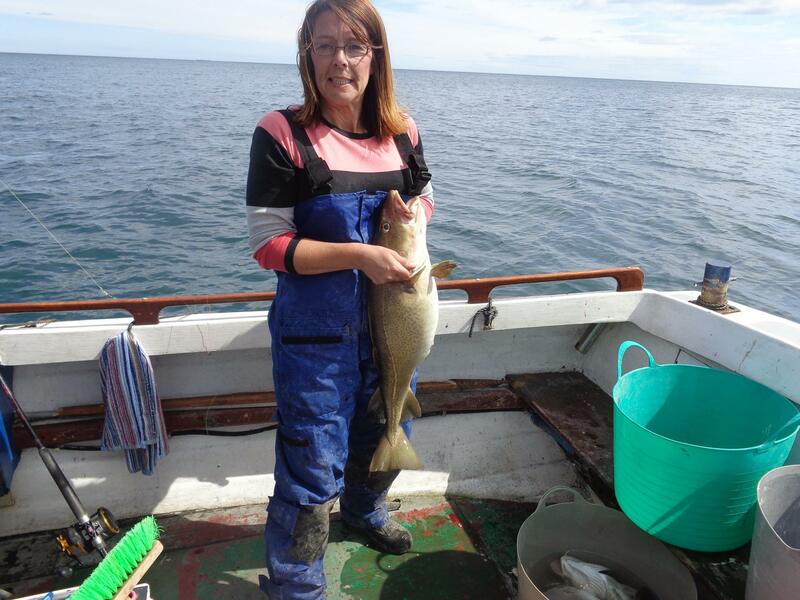 1st, Karen Nibblett, Cod, 9lb 9oz. 2nd, Martin Eves, Cod, 6lb 3oz. 4th, Keith Eade, Cod, 5lb 8oz. 5th, Nikki Kennedy, Pollock, 5lb 6.5oz. 6th, Bill Clapperton, Pollock, 5lb 5.5oz. 7th, Ted Barnfather, Cod, 4lb 2.5oz. 8th, Ian Smith, Cod, 3lb 4.5oz. 9th, Ian Cockerill, Pollock, 2lb 6.5oz. 10th, Debbie Walker, Cod, 2lb 1.5oz. 11th, Yusuf Chardury, Mackerel, 1lb 0oz. 12th, Tony Brazier, Mackerel, 0lb 15.5oz. 15 anglers fished from 8 boats, 1 Junior.